…On the first day of Christmas, my green friend gave to me….a live… Christmas tree. Do you think I’ve lost my mind writing about the twelve days of a green Christmas after Christmas? Contrary to popular belief (and mine), the twelve days of Christmas begins on Christmas Day (the 25th) and ends on the fifth of January followed by the Feast of the Epiphany on January 6, according to Wikipedia. Every country has traditions for celebrating the Epiphany. Here in the US, you have probably heard about preparing “Kings’ Cakes” leading up to Mardi Gras in New Orleans, the “Great Fruitcake Toss” in Manitou Springs, Colorado and the elaborate celebration with the tossing of the wooden cross into the Spring Bayou in Tarpon Springs, Florida, all of these beginning or on January 6, the day after the twelfth day of Christmas. What a history lesson, especially on Christmas Day! I first published these “Twelve Days of a Green Christmas” last year so if you read them last year you will find changes in this year’s “gifts”. If you didn’t read these last year…I hope you enjoy all twelve days of Christmas! Choosing a live Christmas tree can help the environment in many ways. When deciding on a live tree you have a choice between a “live” cut tree or a live planted tree. Cut Christmas trees are rarely hand-sawn these days so fossil fuels are used in the gas-powered saws or generators used to cut the trees. To reduce the number of pests most trees are treated with a pesticide. The pesticide may have a low toxicity level for inhaling but residues of the pesticide have been found in tap water and groundwater. The cut trees are then loaded on trucks to transport them to neighboring or distant states to be offloaded, increasing their carbon footprint. When the holiday season is over your cut tree goes to the curb in most cities to be picked up by a garbage truck and transported to either a landfill where the trees can decompose, a shredding facility where the trees are turned into mulch or possibly to the beaches where they are offloaded to minimize beach erosion. No matter which method of disposal the carbon footprint of your cut Christmas tree increases. A live planted tree is a great alternative to a cut tree. 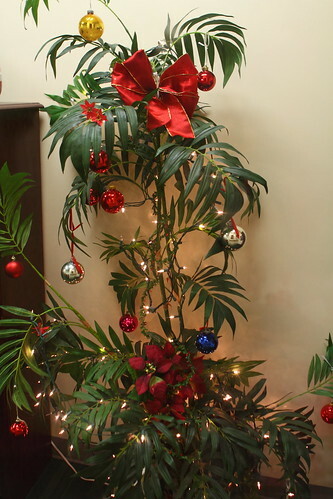 The live tree can be used as an indoor Christmas tree or an outdoor one. It will need water just like a live cut tree but after the holidays it can be planted outdoors and incorporated into your landscape. Make certain to place the tree in the “right” place for survival and if possible place it where shade is useful such as an overexposed A/C unit that works too hard when the sun beats down on it all day or a window that receives too much sun and generates an excessive amount of heat inside your house. Yes, fossil fuels are used to transport many trees to your area yet that carbon footprint is at least cut in half. If you really want the greenest Christmas tree why not change the shape and kind of tree in your mind and decorate an existing tree in your yard for everyone to enjoy! Still have your heart set on an indoor tree…think about buying a local tree in a pot like a young native palm or holly tree and decorating it during the holidays. One of my favorite Christmas trees was a palm tree that found a home in my backyard after Christmas and still provides memories of a most enjoyable holiday! ‹ PreviousUpdate – Duval County HOA Files Motion For Appeal!